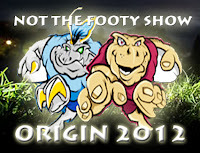 NSW Coach Ricky Stuart has made a number of key positional changes for the Blues heading into the 2012 State of Origin Series - which begins with Game 1 on Wednesday May 23 at Etihad Stadium in Melbourne against Queensland. The official NSW Team was named at 5pm Sunday May 13. GRADE: A- Stuart has rolled the dice in a lot of positions, went a bit conservative on the bench with Creagh and Merrin and may not use Buhrer but Williams is a plus. Gets the A- based on picking Hayne, Farah and Carney in the same team. It gives NSW some (if faint) hope... and sometimes that's all you need. Brett Stewart has beaten out Josh Dugan for the #1 - so for Stewart's sake you hope he stays fit and Stuart stays loyal, the Blues have had a revolving door at fullback and the Stewart brothers aspect is the clear reason he's been picked. Josh Morris has ousted Chris Lawrence for the other centre spot on attacking form and Michael Jennings has rightly been picked as Ricky's #1 centre despite being in NSW Cup this weekend. Bye bye Mick Ennis and hello Robbie Farah who is finally given the keys to the NSW station wagon - let's see if he can turn it into a Ferrari. Ben Creagh beat out Anthony Watmough (who wasn't 100%) and Tariq Sims for a spot on the bench in a surprising move, while Brett Morris misses out due to Jarryd Hayne's match winning ability. Trent Merrin gets another crack on the bench after a good start to the season, while Tim Mannah was no hope. Aaron Woods is a touch unlucky but could still be called in as 18th man. James Tamou makes his debut, as do Todd Carney and Tony Williams who loom (along with Farah and Hayne) as NSW's x-factors... but can they be big enough x-factors when you compare them to QLD's five or six? The Official QLD team was named at 6:30pm Monday May 14. GRADE: A Considering www.wdnicolson.com predicted this team three weeks ago - that should be a sign this is about as good as QLD can get coming into Game 1. Petero is the only question mark based on form, while Corey Parker gets ousted by the guy he filled in for due to injury last year in David Shillington. Cherry-Evans will be 18th man after being pushed out of the bench spot by Matt Gillett, Nielsen is on standby for Hodges (ankle) and Josh McGuire was the only real threat to Petero outside of Parker. This team picks itself, it's simply that good. This squad has won SIX straight Origin series... suffice to say it's pretty good all over the park. NOT The Footy Show will dissect both teams on Episode 106 this Wednesday May 16 at 8:15pm and on the podcast which will be uploaded at 11pm. CAN THE COCKROACHES BREAK THE CANE TOADS DOMINANCE THIS YEAR? NOT The Footy Show's NSW and QLD Game 1 Special will be released on Wednesday May 16th via our iTunes Podcast and on our YouTube Channel. Subscribe to the Podcast here.